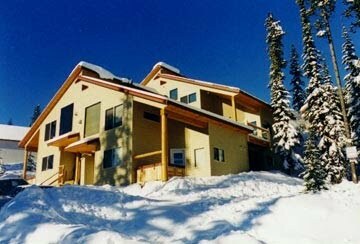 Unit C is a two bedroom, 1.5 bathroom chalet unit. It has queen beds in the bedrooms, a queen sofabed in the upstairs living room and a double futon in the loft. This chalet sleeps 8. There is a ski trail directly in front of the chalet that will take you to the Plaza, Ridge Rocket and Snow Ghost ski lifts. You can read about the other features of this great chalet here.